If you were following our exploits during British Pie Week you might have noticed that I ate Pie for every meal during the week. This was quite a challenge but fortunately I had some help. Morrisons were kind enough to provide a crate of 14 pies on Day Three of the challenge which certainly went some way to helping me decide what pies I should eat for the 21 meals! I was pretty excited to get this stash of pies. It is well documented on Pierate that Morrisons is the only supermarket with a pie counter and hence we have a special affection for this supermarket chain, have a look at all the Morrisons pie reviews we have done. I will now attempt to review all of these pies in one post, assisted by the video diary I took throughout the challenge. Have a look at the photo above and I think you will agree that seeing all these pie together is a beautiful sight. They all arrived in good Condition and the Colour of the pastry was varied, but all of them looked appealing. All of the savoury pies had a great Capacity being quite tall, whereas pies at this price tend to be quite shallow. First up, for dinner on Day Three was a Steak & Ale, see the video below. This was in the standard oval shape that a number of pie counter pies come in. 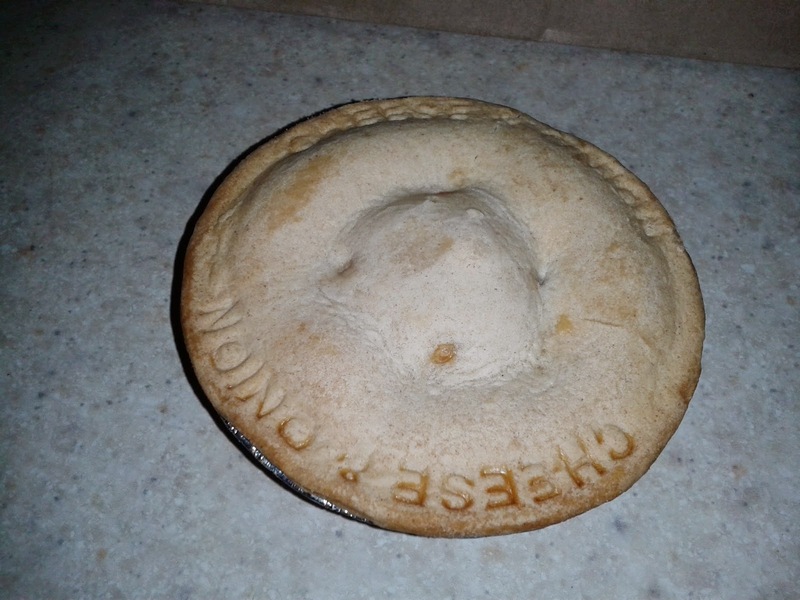 Sadly I would say this was a false start for Morrisons, I didn't find a whole lot of meat Content in the pie but what was there tasted nice and wasn't Chewy. The sauce was flavoursome. The pastry, was crumbly and flour-y as it was for a number of these pies. The pastry lid had some 'overhang' so it missed the optimum pastry to filling ratio. The second pie was better filled than the first so they are lacking in some Consistency. It was £1.70 for two individual pies which is a standard price for these pie counter pies. Considering that a premium pie costs £2 to £3 per pie in a supermarket this puts into perspective that these are not premium pies but 'everyday' pies and I consider this excellent Cheapness for two pies. Morrisons will be pleased to know that on Day Four I ate Morrisons pies for every meal. See the video below. I started with an Individual Apple pie for breakfast. These were slightly smaller and less tall than the savoury pies, but with a bulging lid they still had an excellent Capacity. The Content was packed with apple which was firm to the bite but not Chewy. The pie was not too sweet and overall fantastic value for just £1.10 for two. I can also confirm they are conistently good as I ate one again for breakfast on Day Five. A very impressive offering here from Morrisons. The only downside again was that there was a surplus pastry overhang, however, in this case the sweet pastry was lovely to eat by itself so this wasn't a problem. For lunch I had a Cheese & Onion vegetarian pie. It had a great Capacity although there was a huge air gap which lost it a lot of score. The Content wasn't overpoweringly onion-y or cheesy as I feared it might be, if anything it was too bland. The pastry was the same as with most of the savoury pies. I ate both these pies cold, perhaps heating them up might have helped. For dinner I really enjoyed the Chunky Steak pie which was much better than the Steak & Ale. There was a lot of meat which was fairly tender. There was a good amount of thick meaty sauce. This was the highest calorie pie, perhaps why it tasted better. Well filled despite an air gap, there was a good pastry to filling ratio. Day Five saw me desperately trying to review more of these pies before I stretched my relaxed attitude to 'best before' dates a bit too far. As mentioned already I had another apple pie for breakfast before a Steak & Kidney pie for lunch. I ate this cold but really enjoyed it. It was the same oval shape as the Steak & Ale, filled better but still with a sizable air gap. The cold pastry was not dry at all but lovely and crumbly. I could taste the kidney and found some small pieces but I was pleased that the Content did not taste too strongly of kidney. I think the balance of flavours here was just right for me. I ate the other pie hot at a later date and can confirm that they are Consistently good. 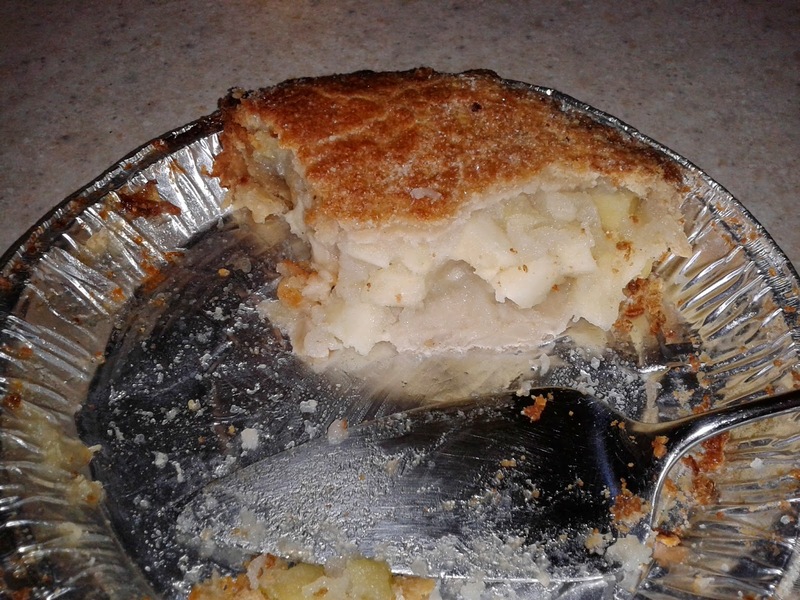 I was unable to eat the Family Apple Pie in British Pie Week because I was only trying to eat whole pies, not slices and it was just too big for me to eat in one go! However, I shared it with my family at a later date and it was again another superb apple pie from Morrisons Pie Counter. The box stated deep filled and it really was with a huge amount of apple content. Firm to the bite, it wasn't too Chewy or too sugary. The pastry had a wonderful sugary glaze meaning it had a superior Crunch and Colour when compared to the individual version. The gooey/crunchy pastry was consistently delicious across both pies. It was also very large for only £2.99, I had some left over when serving four people. It seemed quite similar to the Sainsbury's Taste the Difference premium apple pie but it cost a whole £1 less. Lastly was the hand-crimped pork pie which I have reviewed before. I can confirm it is still worth the 5.55 out of 7 I gave it last year. In all I ate Morrisons pies for six meals in a row. What did I learn? That Morrisons Pie Counter pies are great value and I am still in love with the pie counter. I love how the flavours of the pies are printed on the edge of the pie and I love the crumbly pastry most of them have. It seems that many of the savoury pies have quite large air gaps but at this price they still provide a great value pie experience. At Pierate we are looking for pies that we think people should buy and at Morrisons pie counter the pies are cheap enough that the average person can afford to buy them regularly, these really are pies for the people. Importantly I have also found that it is best to microwave these pies, given that they are already in a cooked state they simply need heating up and this stops them drying out. Or perhaps even forget heating them up at all. Now I realise that these pies work so well cold I think I will be eating them before I get home in the future!